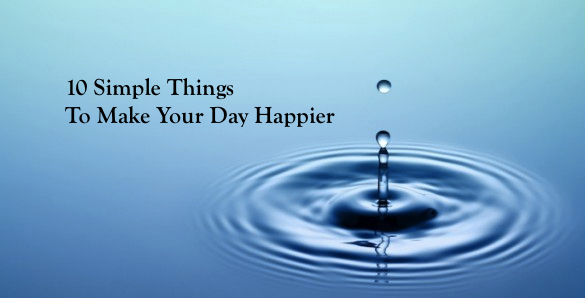 10 Simple Things To Make Your Day Happier – Live. Dream. Inspire. with Lili S.R. 1. PHOTOS. Display Photos of Loved Ones. Seeing the heartiest laugh of your family or closest friends with you could be something that will warm your heart and make you smile even on toughest of days. Make sure you have photos at places you spend the most time at. If you work in an office, have one or two framed up at your desk. If you are always out and about, save one photo as your phone’s lock-screen. You get the idea. 2. WATER. Contact with water does wonders in healing your stress. You might remember seeing children play in the rain or at water playgrounds, such joy shows up on their faces. Try treating yourself to a long warm shower or a warm bath at the end of the day. Don’t rush through this part of the day, it’s equally important as any other sections of your day. Water helps calm you down. 3. GENEROSITY. Do Something For Others. Be generous in your kindness or your time, it’s harder to come by than material things. Sure we will be happy if someone holds the door for us or gives us a seat on public transport. But did you know it’s equally satisfying, if not more, when we do something nice for others? Look around to see who needs the seat more than you do right now, probably a man who looked like he has had a very long day doing manual work, he probably needs a seat more than anyone who has been sitting at an office all day. 4. BE CHILDISH. Be Your Silliest Self Once A Day. Come on, none of us can be serious 100% of the time. We need time to be ourselves, especially our silly self. Having the freedom to express yourself without being fearful of criticism can be quite liberating. 5. MUSIC. If you play an instrument, play it! If you don’t, turn up the volume and sing. If you don’t like to sing, dance! If you don’t like to dance, just leave the music on an enjoy the beat whether you like slow or fast songs. Research has shown that music reduces blood pressure, improves mood and decreases depression. Slow classical music can also induce sleep. So if you have trouble falling asleep, do your ears a favour! 6. NATURE. Immerse Yourself In Nature. This one might be tough for most of us to do everyday. It’s alright to have contact with nature once a week too. It can be as simple as walking barefoot on a nice patch of green grass at a nearby park. Or if you are up to it, a nice walk in the nature reserves close to town would be good. There’s something refreshing about walking in the cool shades of the tree, hearing crickets chirp and birds tweeting, feeling the dried leaves crackle underneath your shoes and smelling fresh air. 7. SUGAR. Treat Yourself With Sweets Of Your Choice. This one should be easy for most of us. While for some of us who don’t like cakes, chocolates and the likes, a simple cool drink at the end of the day is still as good. Fruit juices during lunch breaks are great to lift your energy too! 8. SLEEP. Get More Shut Eyes. People with insufficient sleep will tend to be more moody and unable to think clearly. If you want to have good mood, don’t skimp on sleep. Go to bed early, wake up fresh and enjoy what the day brings. 9. DO NOTHING. Do you know why we crave for holidays? That’s because when we go on holidays we can sit and enjoy the scenery without much worry, no tasks, no appointments, no deadlines. Give your MIND and BODY a break by just sitting down doing nothing. Sometimes too much going on takes away our happiness. 10. BREATHE. I’m talking about taking note of your breath. Purposely and intentionally breathe in and breathe out. Keep doing that for at least 5 minutes. You will realize yourself calming down and feeling more relaxed than before you started. When your mind gets cleared, and yourself calmed down from the stress of the day, you will feel better about everything around you. Next post#001: No Passion? No Worries! Great list. I connect with most of these simple pleasures. Definitely love living near the beach. It’s a place of rest for me.